Make 16 small slits, each about 1/2 inch wide and 1 inch deep, over surface of lamb. Insert 1 garlic and 1 rosemary piece in each slit using tip of knife. Place lamb in large resealable food-storage plastic bag or shallow glass or plastic dish. Mix reserved apricot syrup, the wine, oil, 1 tablespoon of the honey and the salt; pour over lamb. Seal bag or cover dish and refrigerate at least 8 hours but no longer than 24 hours, turning lamb occasionally. Heat oven to 325°F. Remove lamb from marinade; reserve marinade. Place lamb, fat side up, on rack in shallow roasting pan. Insert ovenproof meat thermometer so tip is in thickest part of lamb and does not touch bone or rest in fat. Bake uncovered about 2 hours, brushing once or twice with marinade, until thermometer reads 140°F. 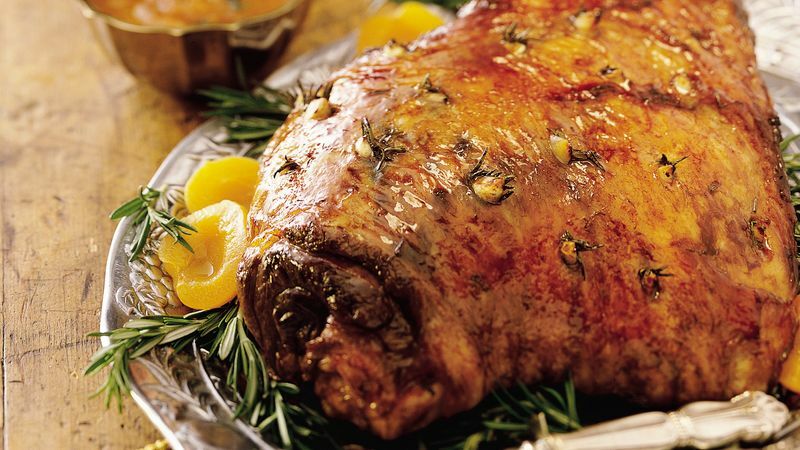 Cover lamb loosely with foil and let stand 10 to 15 minutes or until thermometer reads 145°F. (Temperature will continue to rise about 5°, and lamb will be easier to carve.) Reserve 1/4 cup marinade; discard any remaining marinade. Garnish with additional apricot halves and fresh rosemary leaves if desired. Meanwhile, place apricots in food processor or blender. Cover and process until smooth. In 1-quart saucepan, heat apricots, 1/4 cup marinade, remaining 1 tablespoon honey and the chopped rosemary. Heat to boiling. Boil 1 to 2 minutes, stirring occasionally. Serve sauce with lamb. Plan for the 15 minutes needed to let the lamb stand after cooking. It will cut easier and be juicier.